Dr. Nasr’s research interests include nonlinear systems, mathematical modelling and optimization, neural networks, energy modelling and forecasting, and engineering education. 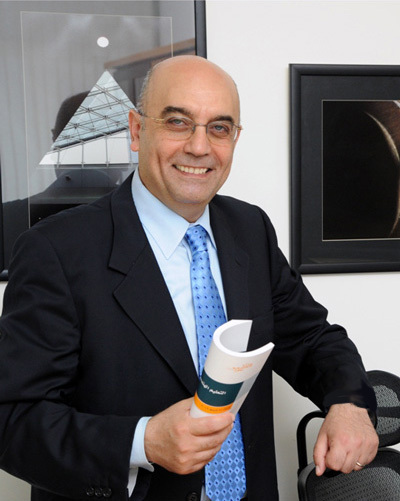 He was instrumental in forming the multidisciplinary energy research group at LAU which has pioneered research on energy modelling and forecasting in Lebanon. Badr, E.A., Nasr, G.E., and Dibeh, G.L., “Econometric Modeling of Gasoline Consumption: A Cointegration Analysis,” Energy Sources, Part B: Economics, Planning, and Policy, v. 3, No 3, pp. 305-313, 2008. Nasr, G.E., Dibeh G., and Achkar A., “Predicting Business Cycle Turning Points with Neural Networks in an Information-Poor Economy,” Proc. of the SCS Summer Computer Simulation Conference - SCSC’07, San Diego, California, July 2007. Nasr, G.E., Dibeh G., and Abdallah M., “Modelling Exchange Rates during Currency Crisis using Neural Networks,” Proc. of the IASTED International Conference on Applied Simulation and Modelling - ASM 2006, Rhodes, Greece, June 2006. Dibeh, G. and Nasr, G.E., “Testing for Nonlinearities in Exchange Rates: An Application to Currency Crisis,” Intelligent Engineering Systems Through Artificial Neural Networks, Vol.14, C.H. Dagli et al., Eds., pp. 735-740, ASME Press, New York, 2004. Nasr, G.E., Joun, C., and Zaatar, W., “A Gui-Based Artificial Neural Network Simulator,” Proc. of the 7th Seminar on Neural Network Applications in Electrical Engineering - NEUREL 2004, IEEE Press, Belgrade, Serbia and Montenegro, September 2004. Nasr, G.E., Badr, E.A., and Joun, C., “Back Propagation Neural Networks for Modeling Gasoline Consumption,” Energy Conversion and Management, v. 44, No 6, pp. 893-905, 2003. Nasr, G.E., and Badr C., “BUC Algorithm for Iceberg Cubes: Implementation and Sensitivity Analysis,” Proc. of the 16th International Artificial Intelligence Research Symposium. 1, pp. 255-259, AAAI Press, Florida, May 2003. Saab, S.S., Nasr, G.E., and Badr, E.A., “Compensation of Axle-Generator Errors Due to Wheel Slip and Slide,” The IEEE Transactions on Vehicular Technology, v. 51, No 3, pp. 577-587, 2002. Nasr, G.E., Badr, E.A., and Joun, C., “Cross Entropy Error Function in Neural Networks: Forecasting Gasoline Demand,” Proc. of the 15th International Artificial Intelligence Research Symposium, v. 1, pp. 381-384, AAAI Press, Florida, May 2002. Nasr, G.E., Badr, E.A., and Younes, M.R., “Neural Networks in Forecasting Electrical Energy Consumption: Univariate and Multivariate Approaches,” International Journal of Energy Research, v. 26, No 1, pp. 67-78, 2002.